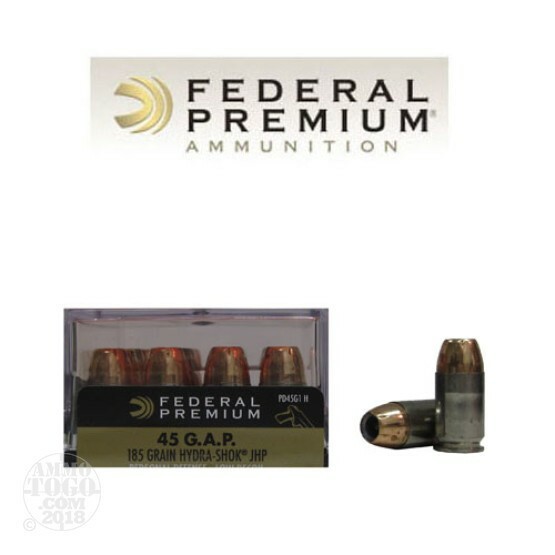 This is .45 GAP Federal Premium Personal Defense 185gr. Low Recoil Hydra-Shok Jacketed Hollow Point Ammo. This ammo contains a post in the middle of the hollow point to give it rapid expansion and deep penetration. This ammo is also very suitable for short barreled weapons and women shooters, because it is a reduced recoil round. This ammo has proven stopping power. Nickel coated brass cased, boxer primed, non-magnetic and non-corrosive. It comes packed in 20rd. boxes. Muzzle Velocity: 1090 fps.